For US online gamblers looking for a challenge, Online Pai Gow Poker is a compelling game to play. It is not fast-paced like other casino games; US poker players get a chance to think strategically before making their move on the poker game. We encourage new pai gow poker online players to familiarize themselves with the basics of the poker table game. The odds are in favor of winning one hand per deal making it a low-risk casino game. It’s better to play poker online because players decide when they want to play without waiting for a seat at the table. Pai Gow Poker’s popularity moved across the country from Las Vegas to Atlantic City partly due to the success of the online game. Read on and learn how to play your cards right with Pai Gow Poker online. Gamblers who play pai gow poker online on great sites know that there are perks that come with playing online. We suggest that players consider the below casino sites before playing. Pai Gow Poker is also known as Double Hand Poker. It is played with a deck of 53 cards, including the joker. Players first place a bet and click the deal button to receive seven cards faced up while the dealer receives seven cards face down. The game provides players with different betting limits to suit their pockets. Out of these seven cards the players are dealt with, they need to separate them into a five-card hand and a two-card hand. The five card-poker hand is referred to as the back hand while the other is referred to as the front hand. Gamblers must compare their two hands once all hands are set to the match hands of the dealer. Players can make 1:1 on their bets if both your hands are better than both hands of the dealer. It’s called a push if one of the poker players’ hands is better than the dealer’s; players lose if both their hands are worse than the dealer’s. The game is loved by most people because players have a common goal, which is to beat the banker. No gambler wants the banker to win because this means everybody else loses. Compared to other casino games, the game pays more regularly than other casino games. These winnings are likely to come out in small amounts because the game generally moves slowly with more push results. Depending on how much players bet, as little as 5% is deducted from the players and paid to the casino as commission. 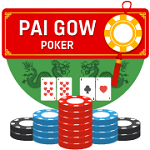 Play Pai Gow Poker online free as a new player to test your skills. Pai Gow poker online casino games can be played for free at top gambling sites. At this point, players don’t have to worry about spending cash compared to when playing pai gow poker online real money. 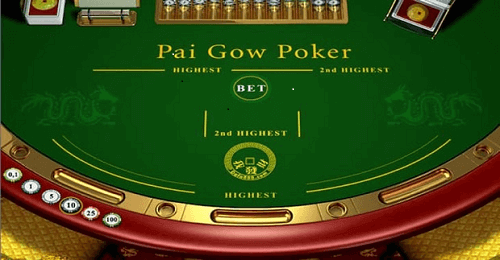 Pai Gow poker free online game can be played without downloading any software to your computer or downloading the free online casino app. This will give what is sometimes called the blackjack poker game players a good indication of whether or not they are ready to play Pai Gow Poker online real money. For players who want to master pai gow poker online casino games, they can play until they are satisfied and ready to bet. Free online poker games allow players to click the chip they have chosen, which will be placed on the table, and then click on the deal button for the cards to be dealt. The flawless software makes pai gow poker online game enjoyable. Historians say Pai Gow is an ancient Chinese game which means “make-nine” in Chinese. 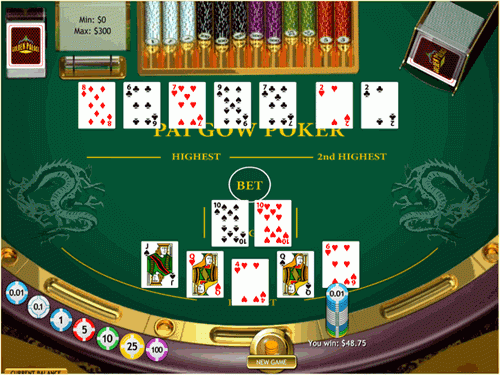 Pai Gow players were served seven tiles which were arranged in the best two combinations. Special patterns were on each of the pai gow tiles with a total of 21 patterns and 32 titles. The pai gow poker online casino games become competitive because players would bet on who could create the best pai gow poker tile combination. In between 1985 and 1986, pai gow made its way to America and Sam Torosian, the owner of California Bell Casino, was more than happy to offer the game in his casino with a twist. Los Angeles citizens combined features of Chinese Pai Gow with components of poker. From the 1990s, pai gow grew to become a casino game played around the world. The history of pai gow poker online game remains alive not only in casinos but in a film. The action film, Premium Rush, was called a great classic movie. The key aspect of the movie covers the understanding and playing of pai gow poker. Players won’t be disappointed to know that the film depicts the real excitement of playing the game. Hand behind – a term for the five-card poker hand (high hand). Hand in front – a term for the two-card poker hand (low hand). Dragon hand – a hand that is dealt to an empty seat. Bug – players who are betting against all the other players at the table. Copies – the term for either low hand or high hand that matches the banker’s corresponding hand. Joker – in the five-card, the joker can be used to complete a flush or straight. With a two-card hand, the joker is always an ace. The joker can be used to substitute for a card (wild card). Push – a term for a tie. Banker – the bank rotates every turn that happens on the table. House Ways – these are rules that all dealers adhere to when constructing their two Pai Gow poker hands. Like with any game, pai gow rules are important to learn how to play the game strategically. The dealer follows certain pai gow poker rules to set his or her hand. Poker players can check the casino’s gaming guide to find out more. Never bet the online pai gow poker bonus. Players are said to instantly lose when they do this. The reason for this is that the online pai gow poker with bonus puts pressure on players to create a winning hand with their full seven cards. The dealer is not involved whatsoever here. Players must remember that their two-card hand can’t be higher than their five-card hand. The house edge is the casino’s average profit from a player’s bet. Players will be pleased to know that this game has a low house edge of approximately 2.9%. This can be cut down to 2.57% when following good strategies. We recommend that players don’t spend more than they can afford, simply because the reality is that they still need to pay their bills.